Ever wondered what it’s like to become a cartoon? Skaja Wills was kind enough to let me share the process with you. 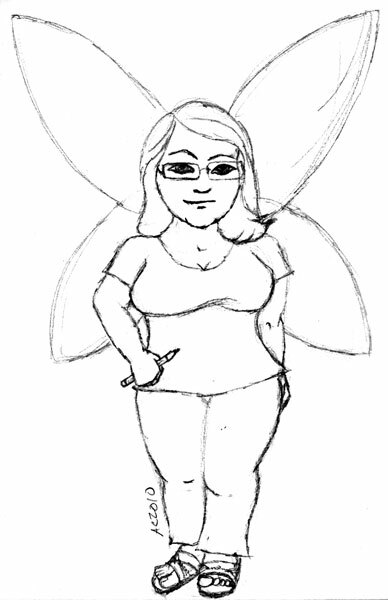 When we first talked about her cartoon, she wasn’t sure what she wanted — she was drawn to the fairy wings, but also liked the stature on the weeble people, so what we ended up going with was something that was halfway between. She sent me a photo of herself in her favorite shirt, and we agreed on a simple pose with blue jeans, and of course the fairy wings. 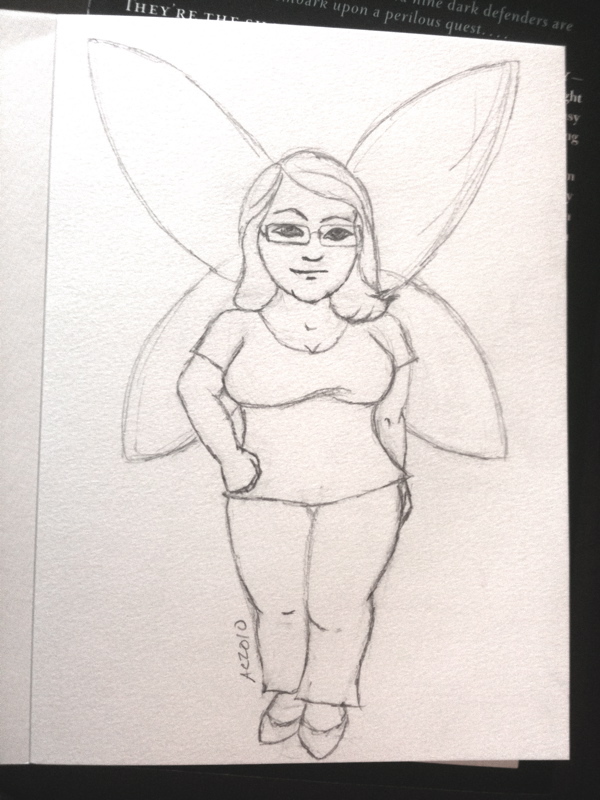 Also done with the scanner, and I darkened up the lines this time so she’d get a feel for how it would look inked. Which was the next step! I always make a high-resolution scan of the inks just in case the client has a use for the black-and-white version, or in the tragic event that I totally screw up the original (I can print out new “inks” and color from there). So far that hasn’t happened, knock on wood! 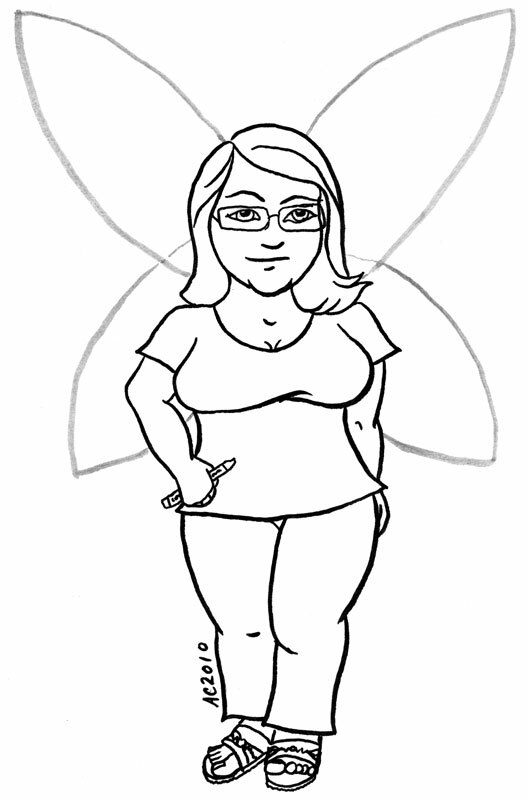 In this case, since I inked the wings with grey rather than black, I even had to scan the image in greyscale. 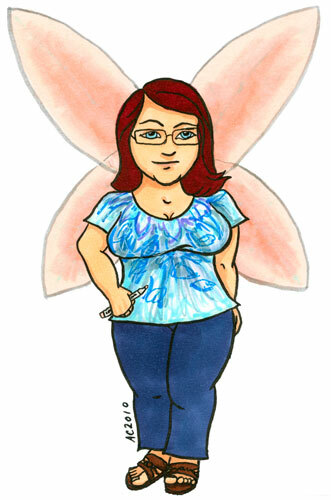 Next we revisited the colors — I asked about skin and eyes, hair and clothes and of course the wings. Then I got out my own Copic markers, took a deep breath, and started coloring. The wings were the hardest, the pink fade wanted to bleed and warp the paper a little, and then the scanner was determined not to pick up the pale blue veins running through them. Once it was all done, I scanned it and sent her a set of files in formats suitable for both web and print applications. Then the original got carefully slipped into a thank-you card and sent off via US Post, winging its way to her! I use a 5″x7″ watercolor paper that’s suitable for framing, though I’m not always that great about leaving space at the paper’s edges for the frame, heh. Thinking you might want one of your own? 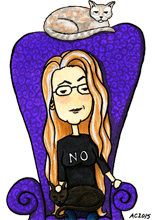 You, too, can Be a Cartoon for only $79! I really enjoy the process, but it’s definitely not a quick or easy one, even with the easiest of clients (like you), so I tried to price it so it’s fair to both me & the cartoonee.